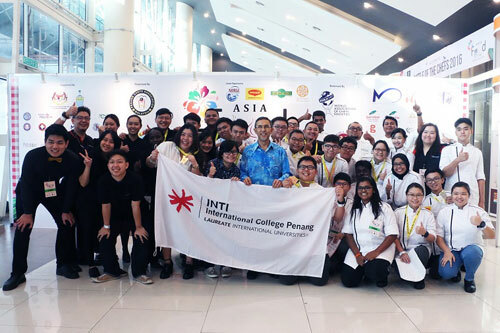 It was a moment of great victory for the 27 students and five Chefs from INTI International College Subang (INTI Subang) and INTI International College Penang (INTI Penang) when they picked up a whopping 16 awards at the recent Battle of the Chefs 2016. The awards included two Gold, one Silver, six Bronze and seven Diplomas across a number of categories, with INTI’s contingent competing alongside more than 1,500 competitors from Malaysia and around the world, including Thailand, South Korea, Taiwan, Indonesia and many others. The INTI contingent from INTI Subang and INTI Penang together with Deputy Chief Minister of Penang, Yang Berhormat Dato’ Haji Mohd Rashid Bin Hasnon. In addition to the guidance from their lecturers, students from INTI Penang were also trained by a specialist industry partner. Tan Ween Nee, owner of SUGAR, a boutique bakery specialising in cakes, was invited to share her expertise with the students during one of their classes. 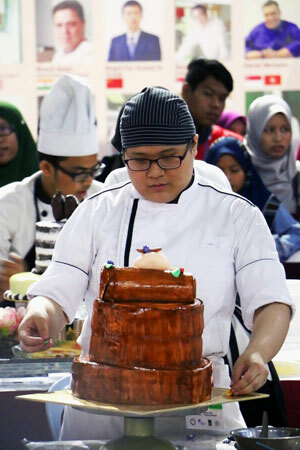 Her insights proved fruitful when the students from Penang picked up INTI’s second Gold award in the Dressing a 2-tier Cake category at the competition. Goh Sook Teng, a student from INTI Penang placing the final touches to their cake. At INTI we strive to provide an education that is individualised to our students’ personal abilities. By providing a curriculum that is based on market needs and expectations, and which promotes participation in a variety of activities such as competitions and events at national and international levels, we empower students to gain the exposure they need to make informed choices and discover the platforms to kick start their futures. “By participating in this competition, our students have gained an edge that sets them apart from their peers. Not only does this achievement demonstrate what they are capable of, it supports the practical experiences that employers are increasingly looking for in fresh graduates. This is the INTI difference we aim to inspire in all of our students,” concludes Christine. Both the diploma and degree programmes also meet the requirements of the Board of Quantity Surveyors Malaysia and the Malaysian Qualifications Agency, ensuring students graduate with the best qualifications to help them secure employment upon graduation.